Top: Grab a slice and pick your toppings. We love this selection from WhatsGabyCooking.com. Center: The classic bruschetta topping: tomatoes, olive oil and basil. 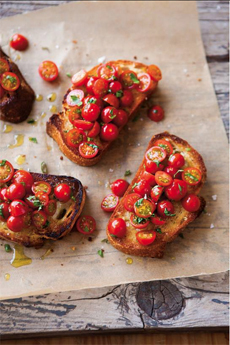 The tomatoes can be halved cherry or grape tomatoes or diced beefsteak or roma tomatoes (photo courtesy Williams-Sonoma.com). Bottom: As a bonus for guests, grill the bread as you need it, so it will be warm. Photo courtesy Brit.co (see their other fun DIY bars). 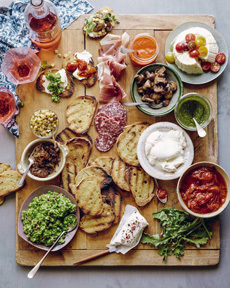 Oh, how we love bruschetta and crostini. Take slices of good crusty bread and grill (bruschetta) or toast (crostini—see the differences below) and add your favorite toppings. Crunchy and savory, it’s our idea of what to have with beer, wine or a Martini. 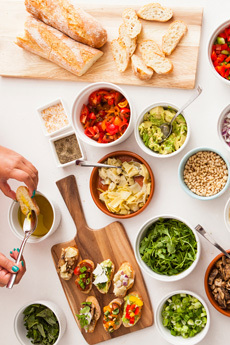 It’s easy to toast bruschetta on the grill, and to take it one step further by setting up a DIY bruschetta bar for guests. If you’re grilling for Father’s Day, it’s a memorable way to start the event, with any beverage from iced tea and soft drinks to alcohol. We’ve seen jars of marinated tomatoes and basil sold as “bruschetta.” It should be labeled bruschetta topping. All you need are bread, olive oil and toppings. For a DIY bar, offer at least three different toppings. Our favorites are below. More options: shredded mozzarella or other cheese (ricotta, spreadable goat cheese, thinly-sliced Brie), fish (we have a passion for anchovies and herring salad on bruschetta), other marinated vegetables, prosciutto or sliced salame with mustard or mostarda. 1. SET out the toppings and teaspoons for serving. We use ramekins; you can use any bowls you have. 2. SLICE the bread from 1/2″ to 3/4″ thick. Rub each side with cut garlic clove and brush each side with olive oil. Add a pinch of salt and pepper. Grill to your desired toastiness. 3. PLACE the bread on a platter next to the toppings and watch people create their appetizers. Bruschetta and crostini are popular hors d’oeuvres/snacks that are easy to make. They’re a perfect pairing to wine and beer, and also can be served as a first course or a light meal, with a salad and/or soup, or with cheese. The differences between the two are the size of the slice and the cooking technique. Bruschetta are cut from baguette-style loaves that are three or four inches in diameter, then grilled and topped. Bruschetta originated in the Tuscany region of Italy, where they are commonly served as a snack or appetizer. Rubbed with a garlic clove and brushed with oil before grilling, they may have been the original garlic bread. Crostini cruh-STEE-nee) are cut from a narrower loaf like a ficelle, about two inches in diameter, and toasted, then topped. Crostini (are croutons: not in the American sense of small cubes tossed into soup or salad, but slices of toasted bread (it’s the same with French croutons). They are often topped with spreadable cheese or pâté. Plain crostini are served with soups and salads, like melba toast, or set out with cheese. Both can be served plain as toast to accompany another food. But with toppings, they are transformed. The toppings for both can be as simple as extra-virgin olive oil, salt and pepper or diced tomatoes and basil, to almost any spread, vegetable, cured meat or cheese—even fruit, such as sliced strawberries with olive oil, balsamic vinegar and tarragon or other sweet herb*. *Sweet herbs include chamomile, lavender, lemon verbena licorice, mint, rose geranium and tarragon.